Somehow during the pumpkin bouquet making process, Karleen became side-tracked with another project. It is wonderful to spend time with a friend who is comfortable enough to follow her heart! Not only did she have a great idea, but a yummy one as well! 1) Bake a chocolate cake and let it cool. 2) Crumble the cake into a mixing bowl and add one container of pre-made frosting. 3) Mix well and then roll the mixture into little balls, like truffles. Then set aside. 4) Then, melt some dark almond bark (chocolate). 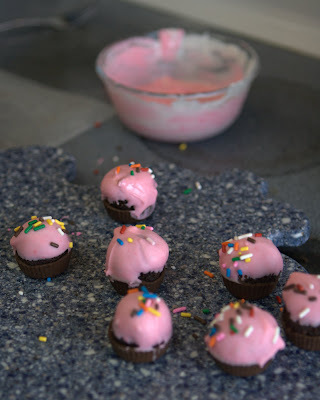 Pour into candy molds that are shaped like cupcake papers or Reese's Peanut Butter bars. 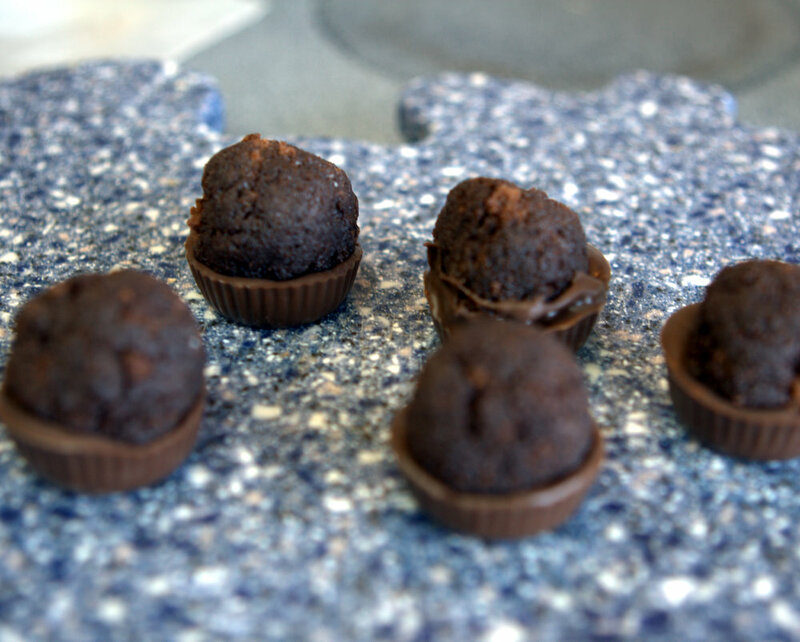 5) After cooling and hardening, place a small cake ball on top of chocolate base. 6) Melt some white almond bark and add food coloring in your favorite color. Dip the cake portion of the base into the melted almond bark mixture. 8) Present on a pretty tray and garnish as desired. Enjoy to the MAX! Thanks for sharing a great idea, Karleen! "You might also just buy peanut butter cups and put the cupcakes on top and decorate them. I think I might have to try this. Thanks for sharing." How cute! I want one! They look so yummy! Wow! Fun at a birthday bash at the hair salon, then special cupcakes with Karleen. I just love seeing friends having fun! 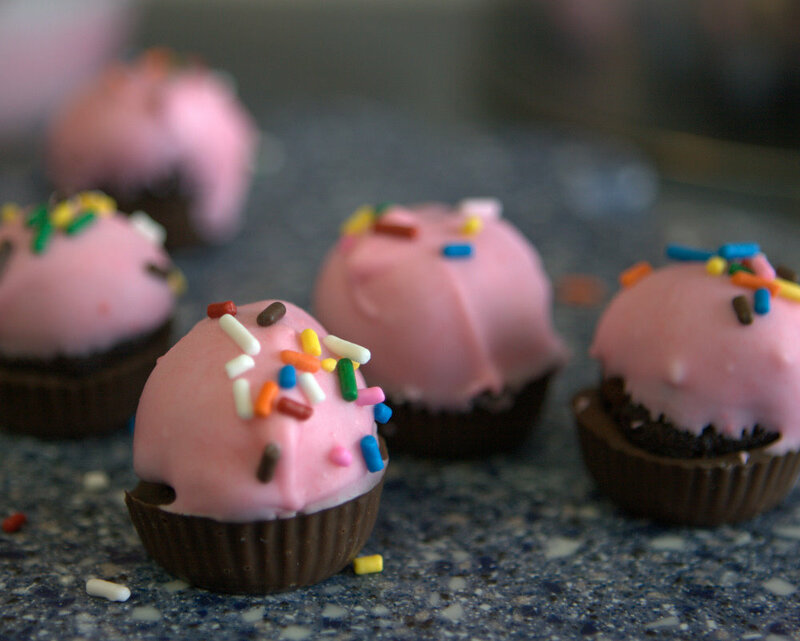 You might also just buy peanut butter cups and put the cupcakes on top and decorate them. I think I might have to try this. Thanks for sharing. Winnie, what a great idea! Simply use real peanut butter cakes as the base! How fun (and how sweet! ).